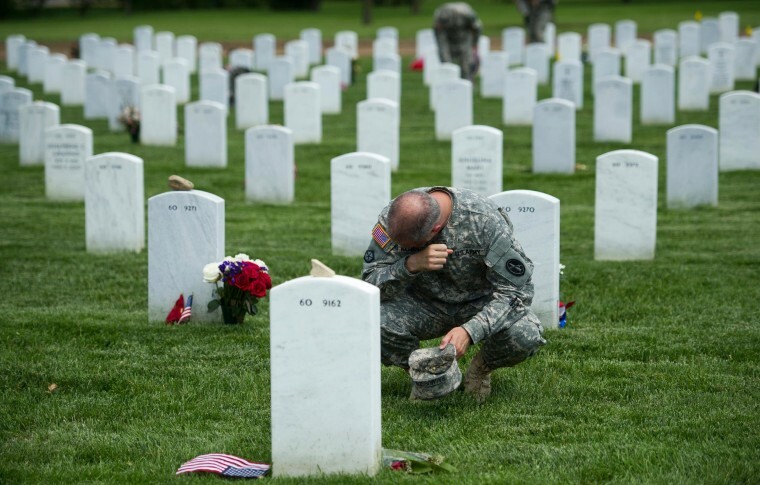 Army Col. Matthew Rasmussen of the Army Military District of Washington wipes tears from his eyes while visiting the grave of Army Staff Sgt. Richard Tieman, 28, of Waynesboro, Pa., at Arlington National Cemetery Thursday in Arlington, Va.
Rasmussen and members of the 3rd U.S. Infantry Regiment, also known as The Old Guard, placed flags at grave sites in the cemetery as part of the annual "Flags-In" ceremony ahead of Memorial Day. Tieman died May 18, 2010, in Kabul, Afghanistan of wounds suffered in a suicide car bombing.